Twofold post for today. Firstly, I got my mug rug completed, so it’ll be in the post to Jan on Monday. Now I know there are people that would have got a whole quilt done in the time it’s taken me to make this baby, but, well, I’m just not that person lol Moving on now, I’m picking up the Amy Butler Sew Along tonight, and then tomorrow is Camelia’s day. 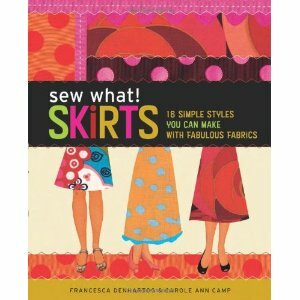 Secondly, just for Kristina, a review of Sew What Skirts by Francesca Denhartog & Carole Ann Camp. There are no patterns. Nope, not one. Instead they talk you through how to draw up your own patterns to fit you, and show how they should be laid out on the fabric for each skirt, plus giving an idea of fabric requirements. Circle skirt with zipper and button closure and trim. For this you need to be able to make a giant compass, and a scientific calculator would be a bonus – remember those maths games which always ended something like ‘take away the number you first thought of and add 7’? The measurements are something like this! So was it worth buying? Well, yes. Apart from the instantaneous skirts you can make just by doing exactly what’s in the book, I think the skirts in this book would be ideal for muslins that could be used going forward on all sorts of things. I’m already eying up that circle skirt for a potential Christmas party dress project! I counted 17. Yep…17. So, which of the A line skirts are you making first? Thanks guys. Maddy, I'm not sure, I have a few ideas, but I need to get other things done first before I break out the skirts lol Still, the main idea I have is more an autumn one anyway, so can't feel too bad about waiting a bit. Hi, Katy, thanx soooo much! You did such a great job, I'm sure all your readers will find it useful. I don't sew based on sewing patterns, so this book might be right for me. On the other hand, I am so into bag making, I don't really have the time for anything else.